What is this plant? They grow very profusely in the area, in lawns and elsewhere. They are a weed or a wildflower depending on your viewpoint. Thanks in advance. It's called Dead Nettle. I personally consider it a weed, my yard is covered with it. 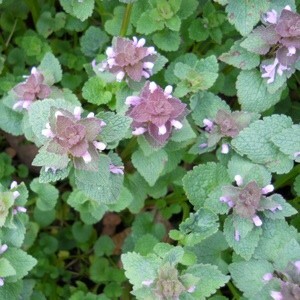 It is lamium and it is a perennial also called dead nettle. I have some but I am in a northern zone and it spreads some but not so much that it can't be controlled. I love it. Thank you very much. I live in the Pacific Northwest and have a lot in my yard. I think I will treat it like the herb it is; mow it and move on. I also like it, it's quite pretty. Love love love this plant! It is the first sign of spring here... :) If you really look at it, the little tubes of the flowers are very delicate and beautiful! Henbit is another name it is sometimes called. Get it before it seeds, I have seen farmers fields covered with it. It is also called Creeping Charlie or Gills-Over-The-Ground. Believe it's in the mint family and is very invasive. My stressed lawn, after a long drought, is full of it.